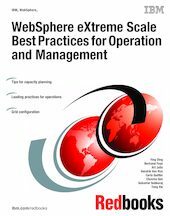 This IBM® Redbooks® publication contains a summary of the leading practices for implementing and managing a WebSphere® eXtreme Scale installation. The information in this book is a result of years of experience that IBM has had in with production WebSphere eXtreme Scale implementations. The input was received from specialists, architects, and other practitioners who have participated in engagements around the world. The book provides a brief introduction to WebSphere eXtreme Scale and an overview of the architecture. It then provides advice about topology design, capacity planning and tuning, grid configuration, ObjectGrid and backing map plug-ins, application performance tips, and operations and monitoring. This book is written for a WebSphere eXtreme Scale-knowledgeable audience.